Freedom 2 Universal Functional Tester is a configurable functional tester that maximizes the uptime of your critical electronic systems. Maximize the uptime of your most critical electronics with the Freedom 2 functional tester from Astronics. Deployed globally for more than 20 years, the newest version of this tester provides a configurable, affordable solution that delivers just enough test. Support legacy systems as well as today’s newer electronics with this flexible tester, where you have the freedom to specify new instruments and software or integrate your own solutions. This universal tester is ideal for use in high reliability industries, including military, aerospace, space, transit, and more. Astronics delivers your solution with an open architecture based on industry standards for fast, easy configuring and efficient operation. The Freedom 2 is your state-of-the-art choice to ensure optimal operation of critical systems. Test your systems from board to box level at your factory, depot, or MRO. 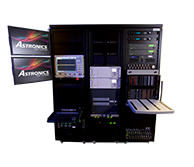 Select components from the library of products offered by Astronics, or, if you prefer, select third party instruments for integration - the choice is yours. Also offer build-to-print to meet your specifications using the FreedomTM 2 as a core platform. Please enter your information below and a representative from Astronics Test Systems will contact you.